It's worth answering: how does the stress of a rapid return to work affect parents, and in turn, cost society as a whole? That question goes only halfway, though. As a researcher who focuses on stress and health within families, I believe there’s a more important question to ask: “How do we pay for the lack of parental leave?” In other words, how does the stress of a rapid return to work affect parents, and in turn, cost society as a whole? Recently, I sought to answer this question by delving into research on the many changes that new parents experience in the first weeks, months, and years after the birth of a new child – and the possibility that all these changes might not just compromise children’s well-being, but also put parents’ long-term health at risk. The U.S. is one of the only countries in the world that does not guarantee paid leave to new parents. The 1993 Family Medical and Leave Act provides for unpaid leave – but almost half of U.S. workers are not eligible, and many cannot afford time off without pay. 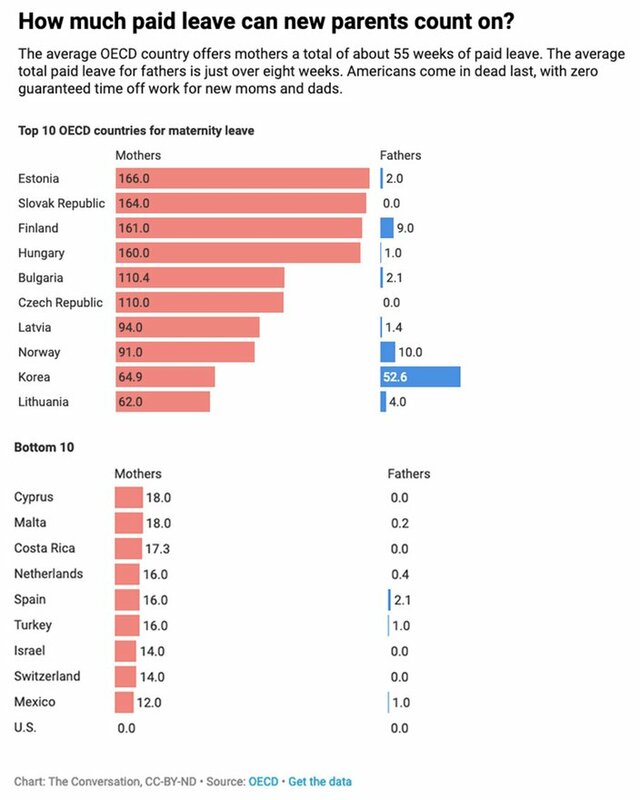 Compare this to the rest of the globe, where paid maternity leave is standard, averaging 18 weeks internationally and extending beyond six months in many developed countries. Stress influences both mental health and weight gain, and may also affect immune and inflammatory processes that can contribute to long-term health risks. Costly chronic diseases like heart disease and cancer drain the economy, and yet few researchers have zeroed in on the transition to parenthood as a potential inflection point in risk for these diseases. Are these risks magnified when parents lack protected time to recover from birth and adjust to parenthood? If so, the U.S. may be setting up new parents – and especially low income parents – to fail. At the neurobiological level, researchers are finding that new parents’ hormones and brains may be particularly changeable – what scientists call plastic. Although many parents eagerly await the arrival of their new baby, becoming a parent can also be challenging, isolating and even overwhelming. Infants require constant care, which can be cognitively and emotionally taxing and physically exhausting. For parents who must return to work soon after birth, the scramble to find trustworthy childcare can also take a financial toll. So what can one conclude from all of this research? Like many windows of dynamic developmental change, the transition to parenthood is a time of transformation that can spur growth – but also brings vulnerability. Research finds that loneliness is worse for your health than smoking cigarettes, suggesting that connections with others may play a profound role in population health. Public health investment has led to dramatic declines in smoking over the last four decades, but hasn’t yet truly tackled social cohesion as a public health challenge. What better place to start than by facilitating the first and arguably most important set of social connections – those that blossom within a new family. This topic is personal for me. When my first child was born, I was a psychotherapy intern at a veterans hospital. As a federal employee, I didn’t qualify for state disability and, as a contract employee, couldn’t access Department of Veterans Affairs leave. My husband, a freelancer, could not take time off without losing income, and I couldn’t quit my job – we needed the health insurance. My wonderful supervisors let me take unpaid time off. But money was tight. Nearby daycares had yearlong wait lists and cost half our combined income. I’m an Ivy League grad with a doctorate, one of the lucky ones, but could barely afford the cost of having a child in the United States.